Waheguru Ji Ka Khalsa Waheguru Ji Ki Fateh. Hukamnama today is on Ang 807 of Sri Guru Granth Sahib Ji in Bilaaval Raag by Sri Guru Arjan Dev Ji Maharaj. Now, the world talks about meditation, talks about samadhi, the state ofd meditation where one is totally absorbed into meditation. But some people say focus upon sun, some say focus upon candles, some focus upon this and that. But Guru Ji says the poora Guru, the blessed Guru, he has deen given me, blessed me with samadhi of sahj complete peace, balance and poise and this samadhi is not a flickering sense of happiness. When Guru Sahib Ji blesses a Sikh withsahj samadh it does not matter if that Sikh is cut into bits, whether he is burned alive, it does not matter what happens to that Sikh. That sahj samadhi cannot be broken because it is focused on that Waheguru who is pervading through all. So that sahj samadh, that true state of eternal peace, focus and concentration is fulll ofanand - that happiness which never ends, final happiness. That is what anand is. And eternal sookh, eternal glee, eternal joy. It is a never ending state of bliss. That is what Guru is talking about, that is what Guru Ji is saying to us today. Not a flickering sense of pleasure but an all enduring sense of bliss. That is the sahj samadh. Those Gurmukh Piaray who are colored in this sahj samadh, in thissamadhi of complete spiritual sense of eternal peace and poise, what is their avastha - state like. Guru Ji says sadaa sahaa-ee sang parabh - parabhu, that Waheguru is alwayssadaa, sang - with them where ever they go. As Guru Arjan Dev Ji says in Assa Raag - gur mayray sang sadaa hai naalay. The Waheguru, Akaal Purakh, the Lord is always with me where ever I go. There is no place I can go where the Guru is not sang, is not with me. Guru Sahib Ji says rehao - pause and think about this. This is the crux of the shabad, this is the center of the shaabad. That Gurmukh Piaara, that beloved soul who is blessed with sahj samadh, where ever they go there is jai jai kaar - there is trumps and cheers. jai jai kaar meaning as in English we say all hail. 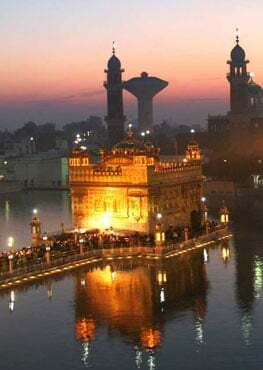 Where ever that Gurmukh piaara goes, where ever that soul goes, that blessed soul is merged into Waheguru. All of the beings bow down to that soul. Guru Sahib Ji carries on with this theme. locheh sabh jee-aa And all the creatures, beings locheh - yearn to have that state ofsahj samadh. Even we don't know, we sometimes feel that we are incomplete. We feel this void in our lives. Some people try to fill this void with drugs, some people try to fill the void with lust and desire,, some people try to fill the void with greed, some people try to fill the void with money and material goods but Guru Ji this void can only be filled withsahj samadh, by true celestial state of peace, that true state of spiritual being which is blessed by the true Guru, there is no other way. When the true Guru, Waheguru Ji, Satguru Ji is suparsan - pleased with me, totally pleased with me, kachh bighan na thee-aa nobighan obstacle blocked my path, nothing blocked my way. That person who with them ang sang - completely with them at all times, has that da-i-aal merciful God, Lord with them. ang in this case means that person who has enshrined God within them, who is completely one with Akaal Purakh and has the complete faith in Waheguru Ji. That is what is calledang in this part of the Shabad. Just as Bhagat Ravidaas Ji says in Sree Raag on Ang 93 of Sri Guru Granth Sahib Ji, tohee mohee mohee tohee antar kaisa Between you and me and me and you Waheguru Ji there is no difference. What is the difference? That person whose ego has dissolved and is completely enveloped by the Lord has Waheguru Ji at their side all the time. So Satgur Sahib Ji says taa kay sabh daas Everyone becomes their daas, everyone becomes their servant who is living their lives in the command of Waheguru, inn the Hukam of Waheguru in that sahj samadh, in that celestial state, spiritual state of complete bliss. Even the elements, the nature, everything comes under control of that Gurmukh Piaara. Everybody endeavors to serve him. Just like when Baghat Kabeer Sahib Ji was arrested by the Mughal rulers of his times. Bhagat Ji was thrown in front of an elephant. Bhagat Ji has told us about this Gurbani on Raag Goond on Ang 870 of Guru Granth Sahib Ji. Bhagat tells us what happened. bhujaa baaNDh bhilaa kar daari-o Bhagat Ji says they tied me like a bundle and threw me in front of the elephant. hastee karop moond meh maari-o The man who was maneuvering the elephant hit the elephant on its head and asked him to crush Bhagat Ji. hasat bhaag kai cheesaa maarai But the elephant backed away and cried out loud,cheesaa maarai. i-aa moorat kai ha-o balihaarai. Bhagat Ji tells us what the elephant said. The elephant when he was crying he was saying I am a sacrifice to that blessed soul. He tells us of this beautiful story. aahi mayray thaakur tumraa jor O my Waheguru you are my only strength, Bhagat Kabeer Ji says. kaajee bakibo hastee tor The kaajee - judge keeps shouting, O make this elephant move onto the driver. ray mahaavat tujh daara-o kaatThe judge keeps on crying to the driver of the elephant, the driver who maneuvers the elephant, I will cut you into pieces if you don't make this elephant kill Bhagat Kabeer Sahib Ji. iseh turaavahu ghaalhu saat Hit the elephant and make him drive, make him go forward. hasat na torai Dharai Dhi-aan , hasat na torai But the elephant does not move, Dharai Dhi-aan meditate it , concentrate it. vaa kai ridai basai bhagvaan Waheguru Ji lives within the elephant. ki-aa apraaDh sant hai keenHaa What aprraDh - sin can the saint have done , baaNDh pot kunchar ka-o deenHaa that you have thrown him in front of the elephant? kunchar pot lai lai namaskaarai Elephant took the bundle of Bhagat Kabeer Ji in his trunk and bow down to Bhagat Kabeer Ji again and again. But Bhagat Ji says, boojhee nahee kaajee anDhi-aara The Kaaji who was blinded by darkness could not understand this. So what does this means? Where does it fit into the Shabad. The idea is jaa kaa ang da-i-aal parabh taa kay sabh daas That person who has Waheguru Ji ang sung at all times realizes that Waheguru Ji i the protector at all times. taa kayy sabh daas Even animals, even nature become their daas - servants, like that elephant that bowed down to Bhagat Kabeer Ji. vadi-aa-ee-aa - Glory and greatness will remainsadaa sadaa forever and forever till the end of times, eternal greatness. naanak gur paas Guru Ji eternal greatness is only found with the true Guru nowhere else you will find. It cannot be done. Only the true Guru can bless us and fulfill the yearning which is inside all of us to behold, to be complete.